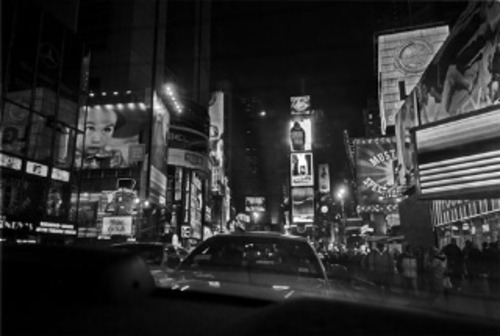 “Times Square from Rear of Cab” , 2003 Photography 16" X20"
Helen K. Garber is known for her night urban landscapes taken in cities such as Los Angeles, New York, Paris and Venice, Italy. 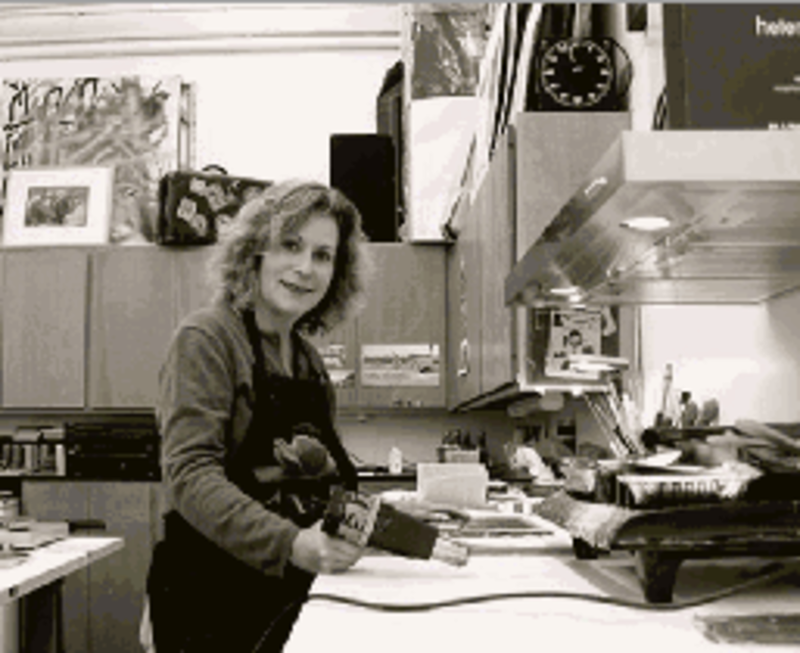 Her images are exhibited internationally and are in permanent collections of museums, private and corporate collections nationwide. Helen's work has been published in a number of books including Parents at Last, Clarkson N. Potter, 1998, Looking at Los Angeles, Metropolitan Books, 2005 and Night and Low-Light Photography, PDN, 2008. Venice Beach, California Carnivale, Xlibris, 2005, is her digitally captured and manipulated photo essay book about her commute from home to studio via Ocean Front Walk. 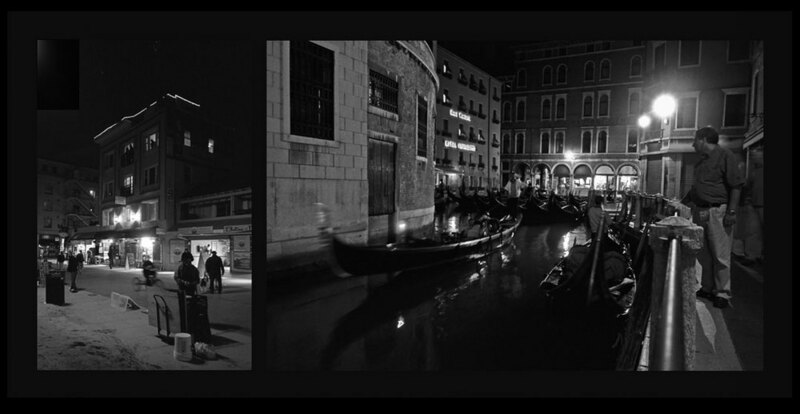 It became the official commemorative book for the 2005 Venice Centennial, the first print-on-demand photo book stocked by Barnes & Noble Book Stores and won an honorable mention in the 2005 International Photography Awards. A Night View of Los Angeles, is a 40-foot long, 360-degree panorama of the entire city of Los Angeles as seen from the Helipad of the US Bank Tower. It was commissioned for the 2006 International Biennale of Architecture in Venice, Italy. 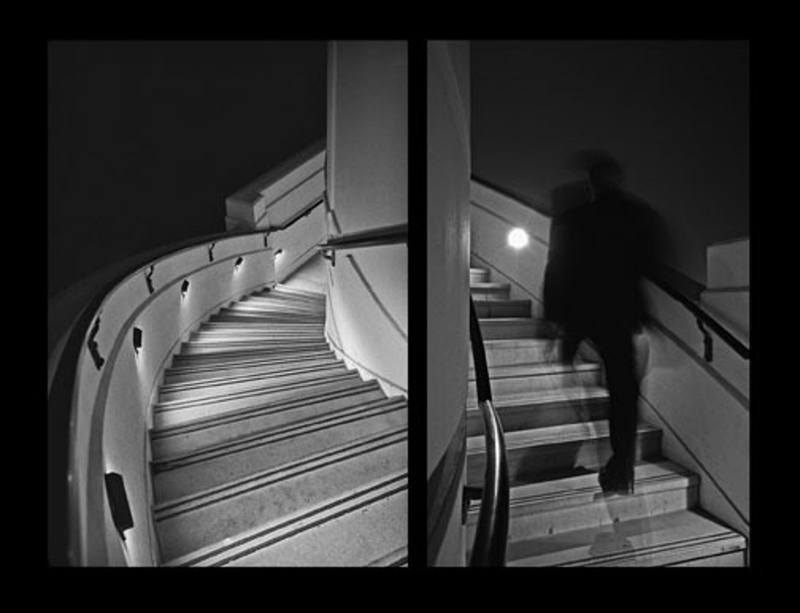 A second print was created for the front entrance of the international photo exhibit, Photo LA, in January 2007. Mayor Antonio R. Villaraigosa presented Helen with a special commendation for the beautiful rendition of the city. Helen then invited the most renowned Los Angeles graffiti artists to use that print as a surface to ceremoniously tag the entire city of Los Angeles at once. She feels that McMansions, Mini-malls, electric wires and other eyesores are equal forms of urban blight as defaced property. All forms of urban blight could be lessened with the re-introduction of arts programming into the public school system. A Night View Collaboration was first installed as a mixed-media piece for the 2007 Venice Art Walk, Venice, CA. Helen is directing a 5 year long group project entitled An Intimate View of Los Angeles where 30 artist/photographers of different cultures and economic backgrounds are documenting their own neighborhood in a subjective manner. Their stories will be exhibited as individual 50 image slide shows presented simultaneously on individual digital picture frames. 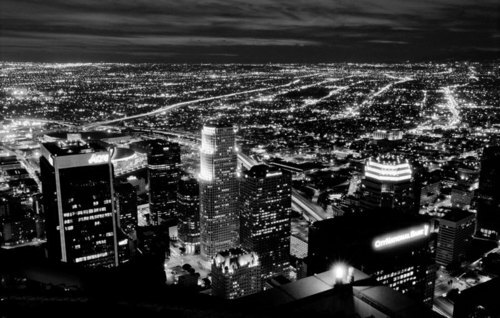 A print of A Night View of Los Angeles completed the installation to allow the viewer to understand the vastness of the territory covered in the project. The installation premiered at MINARC/Gallery Skart in Santa Monica, CA as part of the Month of Photography Festival (MOPLA). www.galleryskart.com/groupla2008 . The show was then re-designed and installed as part of the FADA Los Angeles Art Show, Convention Center, January 2010. 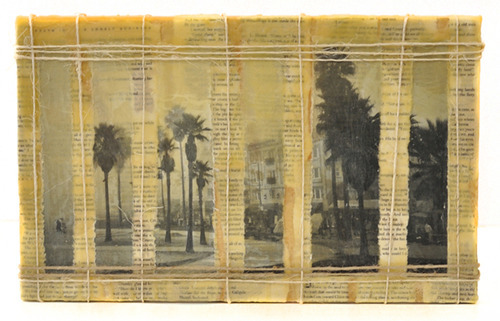 It was reviewed on KCRW, Art Talk, Edward Goldman, April 22, 2009 . The phrase I live in Los Angeles means something completely completely different to every individual. 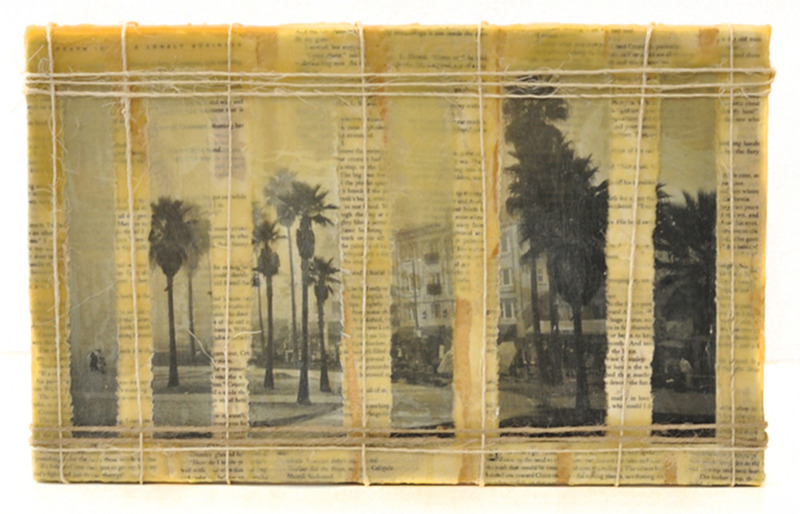 And presenting what would first hit the viewer as a cacophony of images can then be experienced close up, in an intimate manner, to give the viewer the sense of the real Los Angeles. We enjoy dozens of different cultures, climates and geography all at the same moment in time. One can decide to make the effort and move about to experience each neighborhood or not bother with people in the way and choose to remain ignorant of what else is happening within the region. After viewing her 360 degree panorama taken from such a high place, Helen realized that it was a cold, distant view of the city with no sense of intimacy of the people who inhabit the space. She reached out to her network of talented and accomplished artist friends to shoot their surroundings as often as possible starting in January, 2008. The second year group, GroupSC2009 expanded to include 45 photographers and their stories that covered the geographic area from Santa Ynez to San Diego, East to Palm Springs and North to Apple Valley. Again premiered at Gallery Skart for the Month of Photography, 2010. A multi-media moblie projection hub was created out of an abandoned 1955 Shasta trailer that Helen found in the national forest near Idyllwild, CA. Duce covered the trailer with a new mural that represented his feelings about the state of the US economy in 2010. The 45 individual photo shows were projected in 4 different directions from the trailer (named Miss Lucy) on to rear projection screens. The group plans to travel the trailer to all the neighborhoods featured in the project and then with funding, across the US. First stop is Autumn Lights, Sept 25, 2010 in Pershing Square, Downtown, Los Angeles. www.galleryskart.com/groupsc2009. Urban Noir/LA – NY is a multi-media installation and formal photo exhibit that combines her night urban landscapes with text derived from pulp fiction using the city as character and jazz music. It was first presented at the Samuel Dorsky Museum of Art in New Paltz, NY, in the fall of 2007. L.A. 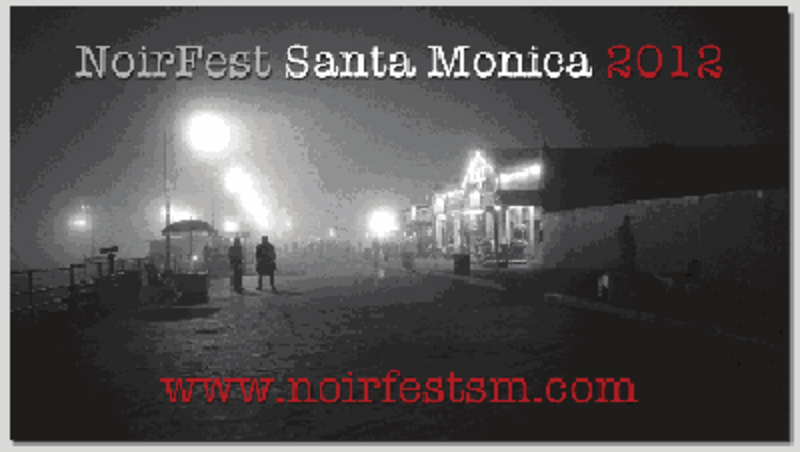 Noir was exhibited at the Farmani Gallery, Los Angeles in 2008. 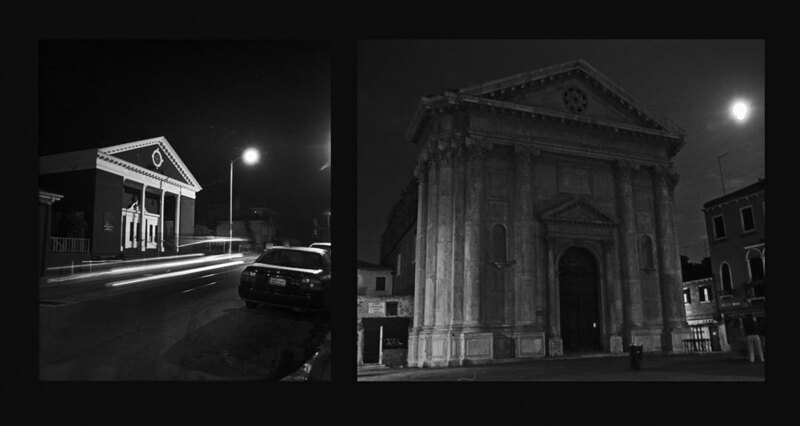 The Los Angeles Conservancy included an installation of Urban Noir/LA as part of it's L.A. Noir Architecture Tour in November, 2008. Helen presented the dvd in Manhattan, NY as part of a symposium on night photography in March, 2009. She will present the updated project with original new music by John Beasley at the Annenberg Foundation of Photography, Century City on June 11, 2009. Please see www.myspace.com/urbannoir for information on the upcoming living noir installation. 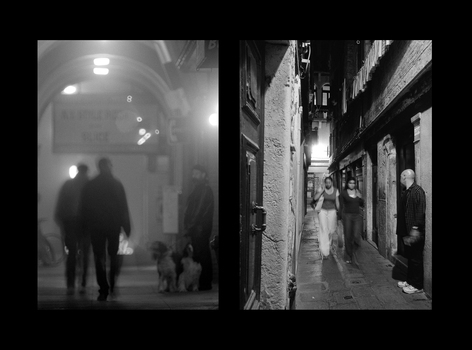 Two diptychs from a new series of Noir Narratives were included in the Night Moves exhibit at the Farmani Gallery, located in DUMBO, Brooklyn NY, on view until April 11, 2009. This is the first time Helen has exhibited in her hometown of Brooklyn. 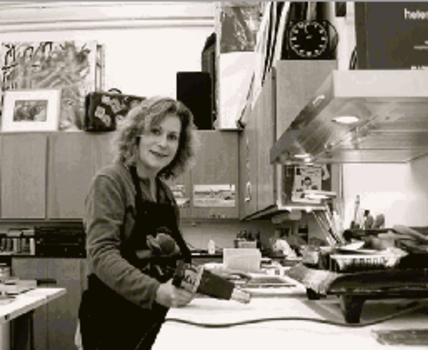 Helen joined DNJ Gallery in 2010 and her work was first featured in their Photo LA Booth in January. Helen premiered her Venice/Venezia portfolio at DNJ Gallery in March, 2010 . Venice/Venezia is a series of b/w pigment ink on canvas diptychs that compare both cities as a metaphor for those residents who live in tourist destinations around the world. Helen moved to California from New York in 1978 with her husband, Dr. Stuart H. Garber (Creator of Dr. Garber’s Natural Solutions). They have lived with various Springer Spaniels in Santa Monica, CA for over 25 years. She maintains a studio on Ocean Front Walk at Venice Beach. Helen’ s representatives, full resume and portfolios can be seen at www.helenkgarber.com.